In the introduction of The Return of the Kosher Pig2, I wrote: “I still remember when I was seven years old; I wanted nothing more than to become a knight with a sword for Purim, my favorite holiday. My dear mother Z”L3 called every clothing store in our local town in Israel to try to find my knight costume. I was very excited when my mother told me to run straight from school to the local pawnshop where my knight costume had been found. I still remember running there with sweat dripping down my face from anticipation. When I arrived at the store, the costume was ready for me and more beautiful than I expected. When the store owner told me he had a surprise for me, nothing could have prepared me for what I felt as he handed me the sword and a shield. From an early age, I was programmed to separate Jesus from our “authentic” Judaism. It was the natural thing to do. However, upon opening this magnificent book called the Brit HaChadasha (New Testament), I discovered a Jewish book with Jewish HaShkafat Olam (Jewish worldviews) written by good Jewish men mostly for Jewish People! My shock was growing. How could it be? I struggled with this question for many years of my life. To my shock, I found that the earlier followers of Yeshua challenged the idea of Gentiles following this Jewish Messiah. How ironic that two thousand years later we ask the question, “How can Jews choose to follow Jesus?” Something went horribly wrong in the last two thousand years as the true and pure Messianic Jewish faith was hijacked by contradictory religious ideas. Thankfully, the Lord is not finished with His Beloved People or the Nations! The two events that will prompt His return will occur when the nations will come to the “fullness” of their understanding, as Rabbi Shaul (Apostle Paul) suggested, and when the Jewish People will cry out, “Baruch haba b’shem Adonai—Welcome in the name of the Lord!” These two events will not take place sequentially, but rather will happen in parallel. The miracle is not merely the return of our Messiah, but rather His restored people, both Jews and Gentiles, working side by side to become a Messiah-centered bride. 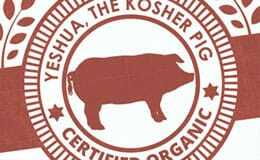 Strangely, in Judaism, the Messiah is likened to a pig. What a seemingly inappropriate connotation, one would think, as it represents the symbol of uncleanness among our people. Why a pig? you might wonder. In Hebrew, the word pig, or hazir, literally means “to return.” Our sages teach us that the rejected Messiah will become pure and clean again to His people. There is no name that is hated more than Yeshua’s name, but in fact His name will be brought back to the lips of every Jew in exaltation in the days ahead of us. So, in conclusion, is Yeshua kosher? Can a Jew believe in Him? I say, ken (yes) and amen today! How I look forward to the day of the “Kosher Pig’s” return, when all of Israel will be saved!